In Shakespeare, it’s the fools who tell the truth, though in jokes and riddles—somersaulting on some wall that’s neither in the garden nor in the palace. 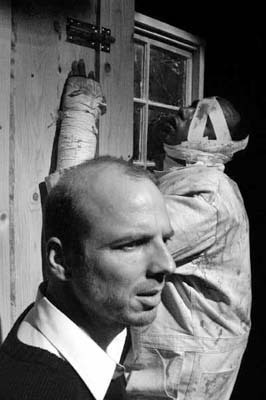 In Vian's brilliant 1959 dark comedy, a respectable middle class family is prompted by an indefinable terror (a strange, unknown and terrifying Noise) to flee upward from apartment to apartment, into ever more substandard and constricting circumstances while maintaining a semblance of calm and denial. While they feel temporarily safe, confident they are building their own personal empire on earth, they are constantly on the run and their world is forever narrowing. Their only release seems to come when they beat on a mysterious, dark-skinned, bandaged man (the Schmürz,) a pitiably denatured person, who appears in the corner everywhere they go and whom they continually flog and maltreat, yet whose existence they refuse to collectively recognize. But the Schmürz always awaits them and the Schmürz never dies. "There is every reason to believe that, as this year's Presidential election draws nearer, there are those who will make a strong case for how much America has to fear from its many, many enemies. They will no doubt attempt to convince us that the only correct response is one of perpetual alert, that only they can be relied on to protect us, and that our enemies are everywhere—hidden, faceless, nameless—as ommipresent and unnerving as the inexplicable Noise that drives this terrified family from floor to floor. This family too is persuaded to accept its situation without question. They too are told to act normally and yet to be afraid. And in their terror and helplessness, they too punish the only thing they can lay their hands on, regardless of whether or not it was responsible for the fear they feel. One might well ask who these many, many enemies are, exactly, and how they came to be so. One might well ask how keeping a population in a state of constant fear from unidentified threats serves the ends of those who would rather not invite excessive amounts of scrutiny into what else they're doing and how they're doing it. One might well ask what the consequences will be of America's recent impulses toward empire-building of its own, its aggressive unilateralism, its arrogant disregard for international consensus. One might well ask why the characterization of any dissent is immediately condemned as unpatriotic, if not treasonous. One might well ask. But there is every reason to believe that those in power would rather you not." The Empire Builders, translated from the French by Simon Watson Taylor, was originally published as Le Schmürz ou Les Bâtisseurs d’Empire by the Collège of "Pataphysique" in their Dossier 6, Paris, 1959. Second edition by L’Arche, “Collection du Repertoire du T.N.P.”, Paris, 1959. Third edition in Boris Vian’s Théâtre published by Editions Jean-Jacques Pauvert, Paris, copyright ©1965 by Jean-Jacques Pauvert. 18 Sep 2002 @ 12:52: Where is Away?